¿Eres uno de nuestros residentes? Enhorabuena y gracias por vuestras propuestas!! Congratulations and thank you for your participation!! Plazo de convocatoria prorrogado hasta el 17 de Abril de 2017. Los proyectos seleccionados se llevarán a cabo el mes de marzo y principios de abril de 2018.
))) Datos de contacto (email, web, teléfono fijo y móvil, skype, otras redes sociales).
))) Imágenes (mínimo una imagen con un peso máximo de 2 mb.). Datos opcionales ))) C.V Biográfico (max. 1500 caracteres). El jurado estará compuesto por el equipo base de IN-SONORA, Elena López Martín coordinadora de la convocatoria de Twitter-Residencias y profesionales del mundo del arte relacionados con el arte sonoro e interactivo. Se seleccionarán un máximo de 5 proyectos, teniendo en cuenta la calidad y viabilidad de las propuestas. El jurado se reserva el derecho de solicitar más información sobre el proyecto al participante, si es necesario, para su correcta valoración. El fallo del jurado se hará público a partir del 28 de Abril de 2017. La lista de seleccionados se enviará por email a todos los inscritos y se publicará en la web: www.in-sonora.org y http://twitterresidencias.wixsite.com/insonora-en. Además de la colaboración de IED Madrid, a través de sus alumnos del Curso One Year de Artes Digitales y Diseño de Experiencias. – Desarrollar su proyecto cumpliendo con los objetivos y en las fechas que le sean designadas, siempre en el mes de Marzo y primera semana de Abril de 2018, y con una duración de 7 días. – Hacer uso responsable del canal twitter @twln_sonora (https://twitter.com/twIn_sonora). Open call extended until April 17 2017. Projects will not be accepted after this date. The selected projects will be developed in succession in the account @twln_sonora in March and beginnings of April 2018. The dates will be specified once projects have been selected.
))) Personal information (First name and last name, place and date of birth, nationality, address, city, country of residence).
))) Contact details (email, web, phone and skype, social). The jury will be composed of IN-SONORA team members, Elena López Martín (TwitterResidence coordinator) and professionals in the world of sound and interactive art. An undetermined number of pieces of each format will be selected, taking into account the quality and viability of the proposals. A maximum of five projects will be selected, considering the quality and viability of the proposals. The jury reserves the right to request more information about the work of the participants, if necessary, for a proper assessment. The verdict of the jury will be announced from 28th April, 2017. The list of the elected participants will be sent by email to all registered participants and posted on the websites: www.in-sonora.org and http://twitterresidencias.wixsite.com/insonora-en. IN-SONORA is working in 2017 in order to get the best scenario for the selected works. So far, we can announce the collaboration with these institutions and spaces: Comunidad de Madrid, Medialab-prado, IED Madrid, La Casa Encendida and Swinton & Grant gallery. – Develop your project meeting the objectives and dates that are designated, always between March and beginnings of April 2018, and during 7 days. 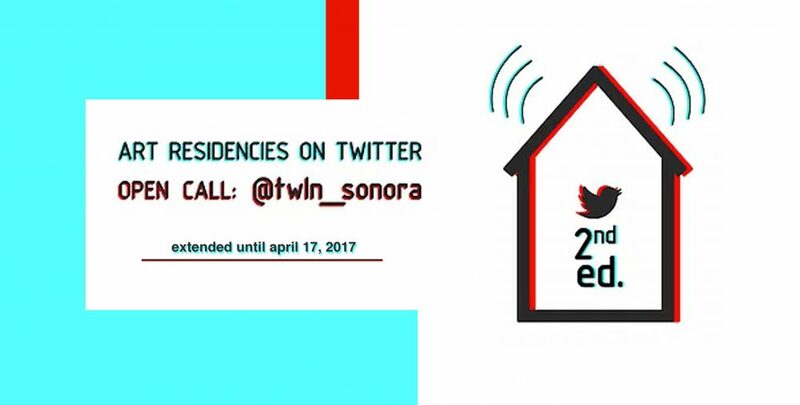 – Make a responsible use of @twln_sonora channel (https://twitter.com/twIn_sonora). Sedes: Sala El Águila, Medialab-prado, IED Madrid, La Casa Encendida y Swinton & Grant gallery. Artes Digitales y Diseño de Experiencias) y el Máster en Composición Electroacústica CSKG.